Struggling to cope with urban life—and life in general—Frankie, a twenty-something artist, retreats to her family’s rural house on “turbine hill,” vacant since her grandmother’s death three years earlier. It is in this space, surrounded by countryside and wild creatures, that she can finally grapple with the chain of events that led her here—her shaky mental health, her difficult time in art school—and maybe, just maybe, regain her footing in art and life. As Frankie picks up photography once more, closely examining the natural world around her, she reconsiders seminal works of art and their relevance. 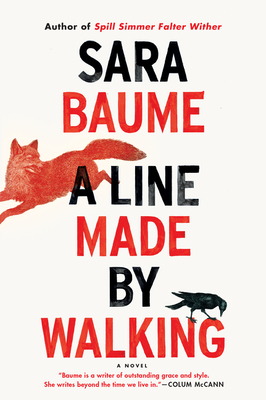 With “prose that makes sure we look and listen,”* Sara Baume has written an elegant novel that is as much an exploration of wildness, the art world, mental illness, and community as it is a profoundly beautiful and powerful meditation on life. SARA BAUME studied fine art before earning a master’s in creative writing. Her first novel, Spill Simmer Falter Wither, won the Rooney Prize for Irish Literature, the Sunday Independent Newcomer of the Year Award, the Geoffrey Faber Memorial Prize, and was short-listed for the Costa First Novel Award. She is also the recipient of the Davy Byrnes Short Story Award and the Hennessy New Irish Writing Award, and lives in Cork, Ireland.